Hello everyone! 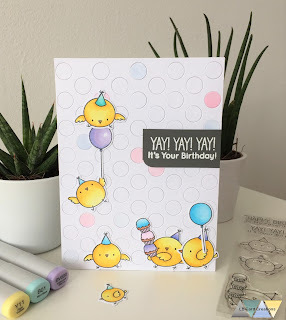 I am showing you another happy birthday card with new MFT stamps. First I stamped the cute animals from 'Jungle Vibes' with Memento tuxedo black. I used the masking technique so that it looks like a great "snapshot". Then I colored the images with Copic colors. For the background I heat embossed the background stamp 'musical notes background' with white embossing powder and blended some distress inks on top of it. Then I diecut the 'square peek-a-boo window' die and adhered everything to a craft cardbase. The sentiment for the set is stamped with a brown ink and added to the card. I added some clear sequins for more interest. Hello everyone! 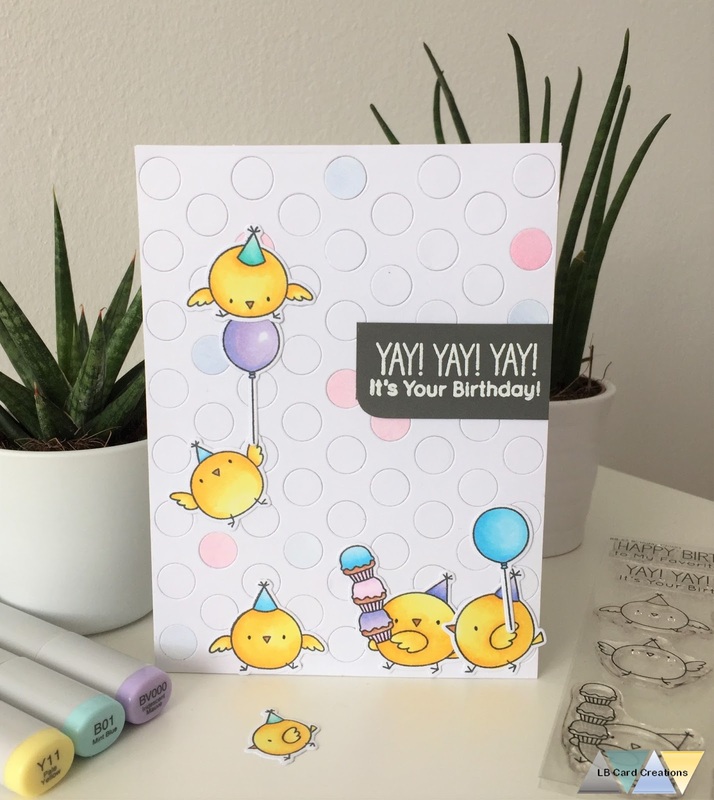 Finally a new card for my own blog :) The recent MFT release was so adorable. I love the new 'birthday chicks' from Birdie Brown. Coloring them with Copic markers was so much fun. Because I colored the chicks all with the same yellow markers it was really quick too. For the background I went a bit out my comfort zone. Normally I love distress ink backgrounds or little scenes but today I went for a very clean background using the 'peek-a-boo polka dots' die from MFT. I diecut the background die from white and colored cardstock - creating some color spots when putting the background together. After adhering the sweet chicks to my card I heat embossed the sentiment included in the set on black cardstock.